Long Narrow Hand What Does it Mean in Palmistry? A narrow hand – water hand shape – In astrology, the water signs are Scorpio, Pisces, and Cancer. Also called the feeling hand. The water hand shape type is characterized by long palms and long fingers, the hand often appears very narrow overall. The star signs do not necessarily match the person with a narrow hand. The fingers will be lean with conic or pointed tips. The hands often feel soft and kind of damp. There are many fine lines all over the palm that reveal someone who is sensitive, intuitive and dreamy. 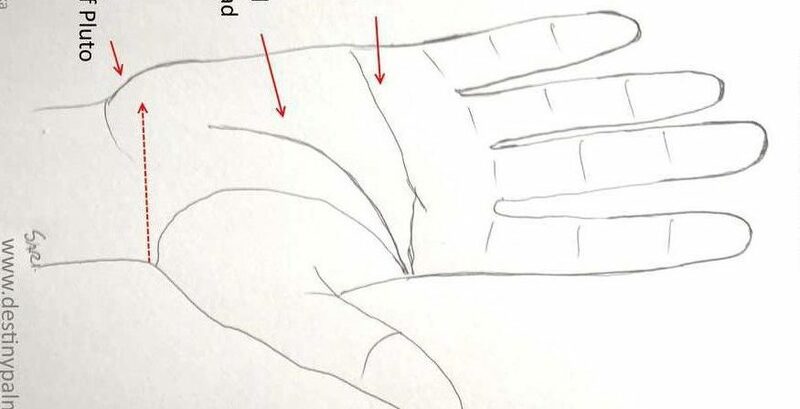 However, sometimes this type of hand reveals signs of instability, (even insanity), depending on other indicators. A very long and deep head line can suggest moodiness. A well-developed mount of Pluto can suggest negative thinking or over imagining. A straight heart line can mean a ‘cold’ personality. 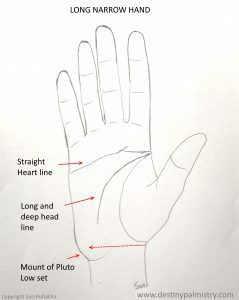 The longer and narrower the hand and fingers are, the slower is their thinking and the more unstable their personality, especially if with a long dipping head line, and a well-developed and low-set mount of Pluto. (see image). Very long fingers can depict a suspicious or cruel nature with a lack of sympathy. For more about the water hand shape and all of the fingers see Destiny Palmistry RECOGNIZE CHARACTER TRAITS WITH JUST A GLANCE! Next PostNext Simian Crease the Single Horinzontal Palm Line.